Yes, belif Prime Infusion Repair Program Ampoules is an intense 6-week program for anti-aging care. I appreciate that these don’t claim to work magic within a magical time period like one or two weeks like most of the brands/products out there. Don’t get me wrong, I do laugh at when I see anti-aging claims within two weeks. Just being honest! Do you remember I told you guys while reviewing other belif products for oily skin that I’m keen to try out their anti-aging range next? I was definitely eyeing on their Prime Infusion range. It’s a fairly new skincare range by belif that seemed to amazing skin regenerative properties. Thanks to belif Malaysia, I was sent belif Prime Infusion Repair Program Ampoules two+ months ago to give them a try. Right now I’m at the end of the fifth week and from tomorrow I’ll start the last week, will be using step 3 – Reactivate ampoule. Are you wondering what actually a skincare Ampoules is? Ampoule or ampoules is something similar to essences or serums. However, it’s not the same, an ampoule is a supercharged and targeted serum with higher concentrations of active ingredients. It works usually as a booster within a time frame for a particular skin crisis. Usually, they come in a glass vial like the DocLab Face Ampoule I’ve reviewed before or in a dropper bottle like this belif Prime Infusion Ampoules. Their thickness and texture also differ from one brand to another brand. What is Prime Infusion Ampoules? belif calls it a 6-Week Repair Program Ampoule. It is formulated to deliver maximized anti-aging effects by 3 steps intensive care. Yes, Prime Infusion Repair Program Ampoules has three steps to follow! That’s why you see three bottles of Prime Infusion Ampoules here. Each bottle has 15ml of product and a different name according to the related step. – The texture of this ampoule is lightest among all three. It’s soft, non-irritating on the skin. The Prime infusion ampoule Step 1 helps to turn uneven skin texture into silky and soft. Added As because of the marshmallow root, its main ingredient, which consists of Mucilage which helps to soften and remove old/dead skin cells. – The recover ampoule is slightly thicker in texture than the Reser ampoule. Prime infusion ampoule Step 2 ampoule is fully nutrient-enriched. It penetrates deeply into the skin and gives both moisturizing and firming effect. Formulated with various types of natural moisturizing agents e.g. Grape Vine’s sap extracted through pruning which contains active properties such as Minerals, organic acid, and flavonoid. – This has a thick consistency comparing other two ampoules, however, its non-sticky on the skin. Prime infusion ampoule Step 3 has the highest concentration of the nutrient-enriched ampoule formula. It acts as a finishing touch to the intensive 6 weeks ampoule program to enhanced skin firmness and radiant. Added Lotus as one of its main ingredients to helps detoxify the skin with its strong anti-oxidant effects. During each step of the Prime Infusion Repair Program, each belif ampoule gives more effective anti-aging effect by nourishing, hydrating, and retexturizing rough skin to your best possible skin. The key herbal ingredient is Marshmallow, Grape Vine’s sap, Lotus and Mountain Daisy flower extract. Mountain Daisy is known by the name ‘The healing herb’ for its purifying and regenerating characteristic. It’s a traditional English medical herb that was loved by the British royal family. No Addition of Mineral oil, Synthetic fragrance, Synthetic Dyes, Synthetic preservatives, Animal-origin ingredients e.g. Parabens, Sulphates, Phthalates. *with solar nectar infusion formula. The booklet provided within the Prime Infusion Ampoule set that has the ingredient list of this product was written all in Korean (might be some other language like Japanese or so) which I can’t read, unfortunately. I looked for the ingredient list on the web and failed to find any. If I find it later I’ll try to update the blog for your convenience. 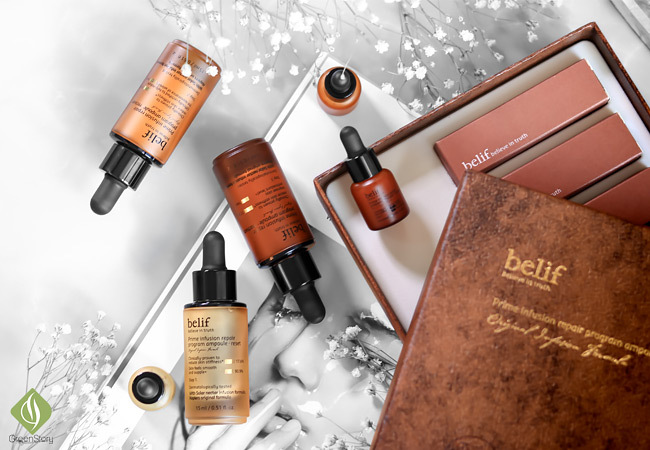 How to use belif Prime Infusion Ampoules? Not any rocket science, use the ampoules just the way you use all other serum. After cleaning my face I use a toner of course! Recently been using Pixi Rose tonic and Klairs Supple Preparation Toner (unscented version) alternatively. Sometimes I was also incorporation The Ordinary Glycolic Acid Toner. I’ve not been using any other serum for five weeks now so I can feel belif Prime Infusion Ampoules properly. In a matter of fact, I didn’t really felt switching to another serum while I’ve been using belif ampoules. Once the ampoules are soaked up by the skin I follow up with my moisturizer. Dor makeup I skip the moisturizer and start with a primer after the using the ampoules. each step of prime Infusion Ampoule you use for one week and then move on to another. 3 week means one round. In the second round, you start again from the step one-Reset ampoule. I’ve been using a quarter of the dropper amount of product each time and twice a day. The 15ml serves exactly for 2 round/6 weeks. How belif Prime Infusion Ampoules worked on my combination skin? It might sound boring using the same product for 6 weeks in a row. But it’s fun because it is actually a 3-in-1 kinda product. All three step has a different consistency and they feel like 3 different serum. So 6 weeks of no monotonousness. The first step of the ampoule is very light in consistency I really enjoyed it with Hada Labo Premium Whitening Lotion. However, in the 2nd and 3rd step, the consistency of the product get thicker. Then I found a thicker toner/lotion like Hada Labo doesn’t really feel good but and light regular toner or an exfoliation toner [e.g. Pixi Glycolic Glow Tonic or Paulas Choice] feels perfect. The one week rotation period belif Prime Infusion Ampoules is a bit too fast. Thus, It wasn’t possible for me to note how they working stepwise. But all together they make a fantastic targeted serum. After using them for five weeks I do feel quite a bit of improvement in my skin texture regardless having slight acne issue earlier. Who is Suitable for belif Prime Infusion Repair Program Ampoules? My skin feels well maintained with the use of belif ampoules. This repair programme is surely a faster option to recover skin health. However, it’s not a cheap product! And if you take time then you can have a maintained skin without an ampoule. But that’s what the ampoules are for, the fast result with some supercharged serum. Price can be considered in cases for sure! Those who need to improve their skin ASAP, like a bride to be, surely find belif Prime Infusion Repair Program Ampoules as a life saver. Those who suffer from the sensitive and damaged skin they will find Prime Infusion ampoules beneficial as well. Because If reduced skin sensitivity to quite an extent. Prime Infusion Ampoules are available at all belif outlets. Have you tried belif Prime Infusion Repair Program Ampoules? Or any other Ampoule that you love and want me to give a try? do let me know in the comment box below. I’ve tried this ampoule really long after my first ampoule try. Been thinking maybe I should try more ampoules in the future!